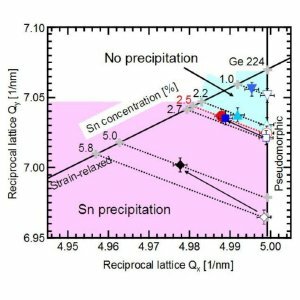 Ge1&#8722;xSnx 224 reciprocal lattice points of single Ge1&#8722;xSnx layers with constant Sn content on virtual Ge substrates as measured by XRD-2DRSM. One promising application of GeSn would be as stressor material for Ge channels. To outperform current uniaxial compressive strained Si channel pMOSFET technology (with embedded SiGe source/drain), it will be necessary to switch to a strained Ge channel. A proposal is to use GeSn materials, which have a larger lattice parameter than Ge, as embedded source/drain stressors for Ge channels. An alternative would be to implement bi-axially strained Ge grown on top of a so-called strained relaxed GeSn buffer. In addition, GeSn materials may prove also interesting for photovoltaics and optical applications. The literature predicts a direct band-gap for sufficiently high substitutional Sn concentrations.